Mozilla Sweden Meetup — det BLEV kul! After arriving safely in Skövde for The 5th International Conference on Open Source Systems (more on that later), I finally had some time to reflect on the Swedish Mozilla Meetup event in Stockholm last Tuesday, which was a fantastic opportunity to meet with enthusiastic Swedish Mozilla community members and others that were still just curious about our project and what we do to help promote the open web. There were four presentations during the event, where I was one of the presenters. I talked about community-powered support and SUMO, including the unique challenges Mozilla has with user support of a very popular open source product, and the importance of localization. The artist currently known as Tomcat gave a presentation about Mozilla QA and the many opportunities that exist for people to participate. One of our Swedish community members — incidentally also a Bruce Willis clone — Robert Nyman walked us through the process of creating an extension for Firefox that replaced all headings on web pages with the titles of the popular Die Hard movies. Finally, Mozilla’s European community marketing star William increased everyone’s excitement of the imminent launch of Firefox 3.5 by demonstrating various ways we can all help with community marketing to further promote Firefox, open standards, Mozilla, and our mission. Interestingly, some people in the audience didn’t even know that Mozilla had a marketing team in the first place! 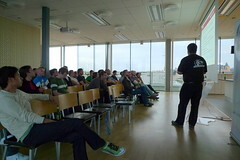 The slides of all presentations can be found on the meetup wiki page. I rarely put a lot of text on my slides anymore and instead use images and illustrations as a compliment to the actual “verbal delivery” of the presentation, so my deck may or may not be very useful in itself. A big, big thanks goes to our favorite Liverpool native and Eskilstuna resident Patrick Finch for organizing this first Mozilla Sweden meetup event. Although I offered to work with him on it from the very beginning, being the hard-working, independent, and professional person that he is, he just took the project and ran with it — and as usual, it turned out incredibly well. Photos from the event can be found on Flickr under the stomozcom tag. This entry was posted in mozilla and tagged mozilla, stockholm, stomozcom, sumo, support, sweden on 2009-06-04 by David Tenser.